Bluewater cruiser! RARE FIND! The Alajuela Passporte 48 was built for people who want to sail the oceans! True Bluewater Cruising Ketch. High performance sailing yacht of high quality fiberglass construction and suitable for ocean cruising and racing. Strongly built and factory finished in Costa Mesa, California. Built to Lloyds Standards. These boats rarely come to the market. 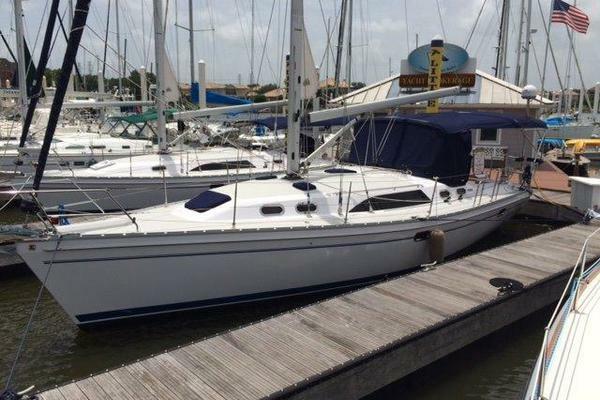 Alajuela Yacht Corporation built the Passporte 48 for people who want to sail the oceans and you have their assurance that the boat was built with the readiness to accept the challenge. Raymond H Richards, a well-respected naval architect and marine engineer, designed the Alajuela Passporte 48 to be a first quality, high performance sailing vessel suitable for ocean cruising and racing. The hull is a blend of classically styled topsides with a modern, hydrodynamic efficient underbody. It’s raking stern and patrician sheer and proportions are finished with a modified canoe or cruiser stern. The deck line is reasonably full into the ends and produces a gentle flaring in the bow. The keel has an advanced foil which generates the lift necessary to windward performance. These proportions allow the ballast to be placed very low for greatest effectiveness. Rig proportions are tall, efficient and generous in area taking advantage of the powerful righting moment spectrum the hull will develop. Spaciousness is evident on deck, the wing decks are broad and protected by deep bulwarks. The cockpit has two levels where the helmsman is placed a head taller than the sheet handlers giving him maximum frame of reference for handling the vessel. A variety of winches are found on the unusually large coaming flats in the cockpit. Among the unique features of this design is the “lido” deck. It is bounded by a coaming topped with a fixed rail. While it provides security to and from the companionway and additional working deck space, it is named for it’s third function, lounging. Due attention has been given to navigational needs. A large chart table with electronic equipment is part of the saloon area. It is protected from the weather coming down the companionway and yet the navigator has but to step around the ladder to gain the deck. The huge saloon aft has the feel of a traditional great cabin. The quarter berths and settees make fine sea berths. The owner stateroom amidships has a private head. The berth is a full double which can be divided by a bundling board to provide single sea berths. The guest stateroom has an upper and lower which can be converted to a double. Connecting the owners head and guest stateroom is a large bulkhead shower space/sauna. The foc’sle has full headroom in way of the hatch and is fitted with lockers and bins for ground tackle, stores and sails. The machinery arrangement is equally notable. The propulsion engine is located below the cabin sole in the tuck of the keel amidships offering ideal accessibility, contribution to the transverse stability and the level shaft line and propeller location ensure optimum propulsive efficiency. The A48 is a terrific blue water boat. She is nimble, fast, solid and seaworthy. She weighs approx 34000 lbs, and has a 6’-9 inch draft. The ketch configuration is easy to balance. Out of the water, the boat is a true beauty. The keel has an airfoil shape, but no-one would ever consider this a fin keel given the 12,000 lbs of lead in her and the fact that the keel is over 12 feet long. The rudder is also airfoil shaped and perfectly balanced on a skeg. These boats were built to Lloyds of London credited standards. She can turn circles in 1 1/2 boat lengths and is easy to manage. See Utube video sailing 9 1/2 knots wing on wing. Unique layout featuring a very large salon in the stern with a navigation desk at the base of the companionway steps and a large U shaped galley opposite. The sleeping accomodations are two main cabins, double to starboard and bunks that can convert to a double to port, both are situated midship on either side of the main mast for ease of motion at sea. Forward to port is the cedar lined shower with teak grate floor and separate manual head to starboard. Four additional single sleeping berths are found aft on the salon settees and two berths to the backsides of the settees for a total of 4 singles. Forward head at base of the companionway. Workshop/Sail Locker in the V cabin. The cockpit has two levels, the helmsman is placed a head taller than the sheet handlers with unobstructed access from side to side. A variety of winches, cleats and instrumentation options are possible on the unusually large coaming flats along the cockpit. The wing decks are broad and protected by deep bulwarks. 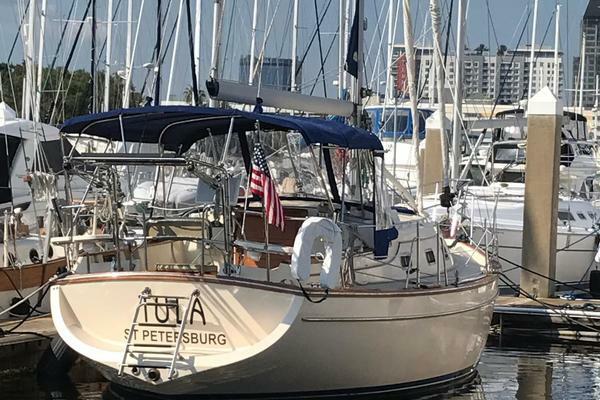 Among the unique features of this boat is the "Lido" deck which is bounded by a coaming toped with a fixed rail which provides security to and from the companionway, additional working deck space and lounging. Hull is molded in one-pierce from hand-laid fiberglass varying in thickness from 1.5 inch near the bilges to 1/2 inch at the topsides. Inside the hull, there are no liners, it's all wood bonded to the hull which is durable while providing accessibility to everynook and cranny. Main diesel located low to contribute to ballast.